Bridges aren’t always truthful; can say they are 65 ft yet in certain conditions they are less. If a bridge is listed as 65 ft, that means it has that much clearance at high tide. We need 63 ft (plus a few inches) and cautious us, we want the bridge to have at least 64 ft. Looking up as one approaches, is so deceptive. You would swear the mast was about to hit, but no, you’ve got a few feet to spare. As I’ve said before, I hate looking. If the mast ever hit; damn that would ruin our day and then some. We left Tidewater Yacht Marina in Portsmouth, Friday morning around 10:15. The forecast for today and the next 6 days was low winds and sun. Sounds good to me. The official start of the AICW is here and you spend your first day adjusting your speed to meet the bridge openings. The first 20 miles contains six scheduled opening bridges and one lock. Those hanging a right at mile 7 for the Dismal Swamp route contend with more locks and fewer opening bridges. The area closer to Portsmouth also has several lift bridges that are usually up. Making friends is always a good thing to do and you never know who might help you out some time; paths cross a lot along this waterway enjoyed by so many. At the least, temper your judgments and criticisms – we clearly recall being newbies only last year! A 44’ Hunter left the marina a short time before us; nearly smashing into a piling and another boat’s dinghy as they motored out the fairway. We caught up to them at the first opening bridge and followed them until we anchored. They managed to entertain- and I use that word loosely and only in the kindest way- us a few times with the usual monohull going aground antics- minor, very minor. 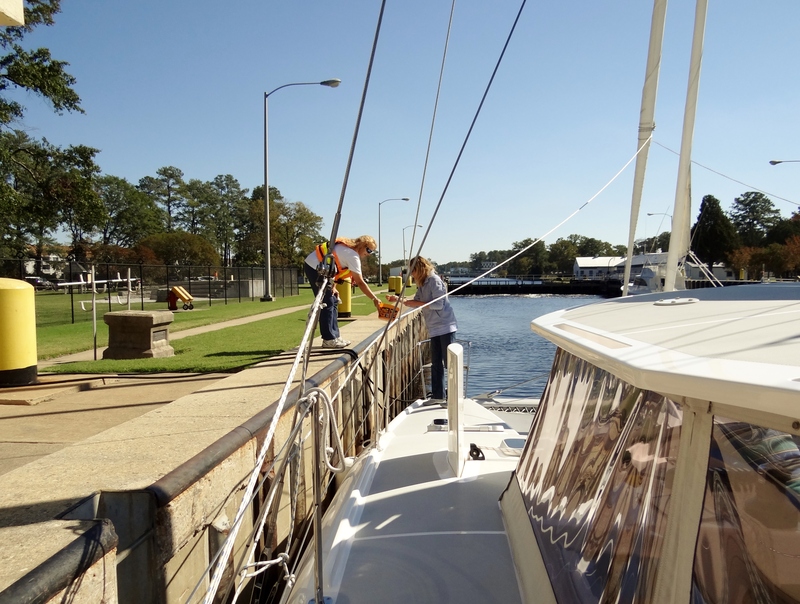 At the Great Bridge Lock, the lock tender warned the sailing vessels that the 65’ bridge at Pungo Ferry – gotta love these low country names -might have less than 65’ due to recent high winds and the gales that kept us in Atlantic Highlands. A few miles south of the Lock, we and the 44’ Hunter approached a 65 footer with no height board- sigh. As they inched closer, me watching with the binoculars, I thought for a moment they weren’t going under, but they did. I immediately hailed them on the radio to ask about their total height above the water. 64’2”- ouch that is way to close. See? Friends. We crawled under. I stood on the side deck, binoculars glued to the top of the mast. We cleared with what looked like 8” to spare. Oh boy, can’t wait for the Pungo Ferry bridge. Our selected anchorage for tonight was Blackwater Creek, 2 miles south of the bridge. We knew from last year that anchoring north of the bridge was only possible just off to the side of the ICW, not in any creek or bight. All shoaled or filled with deadheads and wrecks.Ugh. As we turn the bend we see 2 sailboats anchored off to the side just before the bridge- uh oh. The one in front was a Shannon 53- motorsailer nearly as wide as Ortolan with two masts, one taller than ours. The Hunter tested the bridge and turned around. The Shannon, Moon Tide had AIS so I hailed them, no reply. As we came up, they were heading back in their dinghy and we asked about the bridge clearance. Yep- height board on this one currently displaying 63 ½ ft. We think we are 63′ plus a couple inches. What did we do? What would you do? Anchored with the pack of course. The 63 ½ was a one foot improvement over yesterday; passing under tomorrow would be doable. Negligible current, light winds, no problem. I proceed on my usual boat check out with binoculars – want to know whose around. Don’t you know I look at the other sailboat anchored behind the Shannon and guess what name I see on the stern? Think. Ok, now go back to my last post. None other than s/v Golden Eye; 40ish foot classic lines monohull with two wooden masts. One guy is fishing. 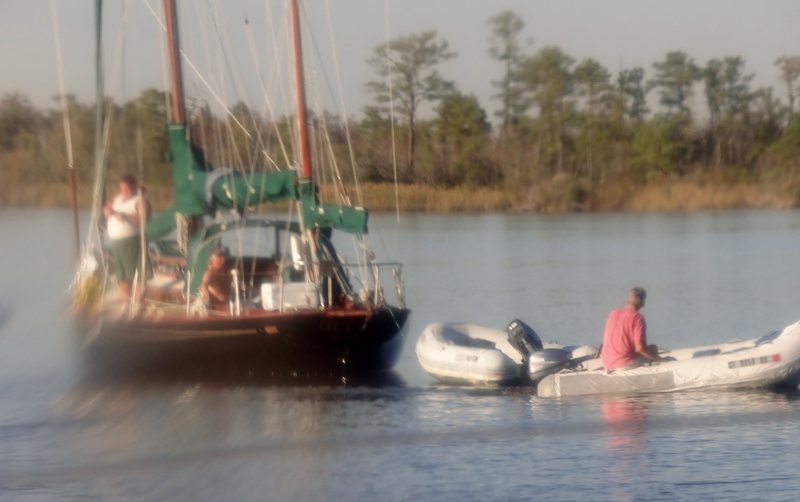 We launch the dinghy to set a stern anchor and keep us out of the channel; getting hit by a barge is not on our to-do list. Now, here’s our chance to get the complete story. Russ goes over and comes back with: yep it’s them. Left in the gale as had a schedule to keep. Sailed 50 miles offshore, tacking because they didn’t have a good angle heading due south. No VHF turned on and of course no cell 50 miles off! The owner’s son called the Coast Guard when he didn’t receive the scheduled phone call. I snuck a shot through the strataglass; no point in being too obvious. Following your progress with geat interest. What port/ports in NC are you planning on…living in Raleigh, it’s a short drive to the coast & it’d be nice to see the boat…and you both…and say Hi. Yes, we’ve entered NC! Hanging out in Manteo now. Plan to head to RIver Dunes marina in Oriental (outskirts) once weather conditions become favorable. We’ll check in with you when we have a date (range); would love to meet you and show you Ortolan.